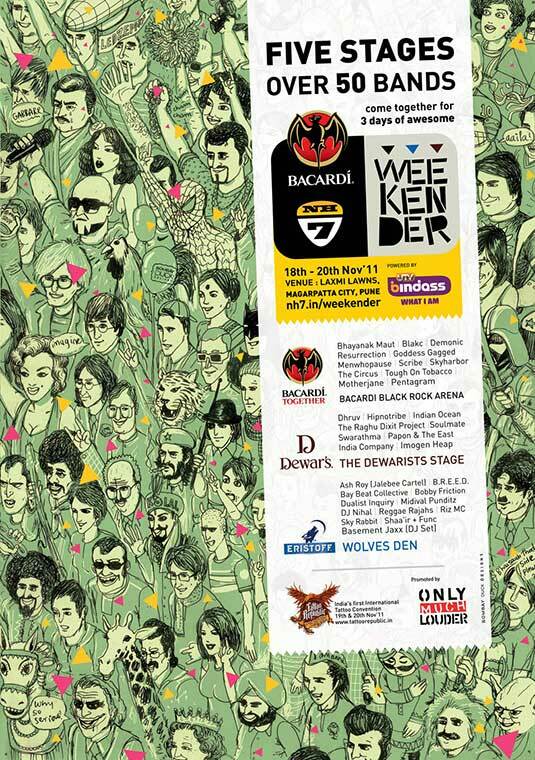 The happiest music showcase festival in India, the Bacardi NH7 Weekender, kicks off today and takes place over three days, from November 18-20. If you’re a regular reader of Helter Skelter, you’ve probably been following our #7DaysToNH7 countdown over the last week, which includes features and interviews with organisers, artists, and festival-goers. If you haven’t checked it out yet, you should. Also, if you’re going to be at the festival, do take the time to check out Sameer Kulavoor’s and Lokesh Karekar’s 100% Zine booth. The inaugural issue of the magazine will go on sale at the Weekender and from what we have seen in the previews, it promises to be visually stunning. Each issue will be based around a theme (the first one is aptly themed, Sound) and artists will be invited to contribute original content on the topic. And given the fact that 100% will be designed and curated by both Kulavoor and Karekar, two of the most interesting illustrators in the country today, the magazine has the potential to emerge as a cutting-edge art print publication.